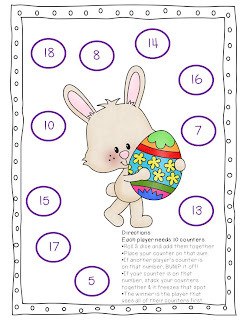 I am filling your basket with math centers to play BUMP! - for both addition and multiplication! Since it's almost Easter, I have created one board for Easter (pictured below) and three boards with spring themes. Click here or on the image below to fill your basket! Thanks for stopping by and visiting! If you are new to my blog and liked what you see, don't forget to follow me. A Tisket, A Tasket, next up with a Freebie for your Basket is Teresa from Fun in K/1. Hop on over!